October is here and in my part of the world the heat has arrived too. The past few days Mr E and I have spent time in the garden of our new home making plans, weeding, watering, removing dead plants, re-potting a few lovelies we brought with us and planting a couple of new purchases. There's much to do and summer is hot on our heels here in the tropics so we're prioritising what must be done soon and the rest can be done bit by bit. 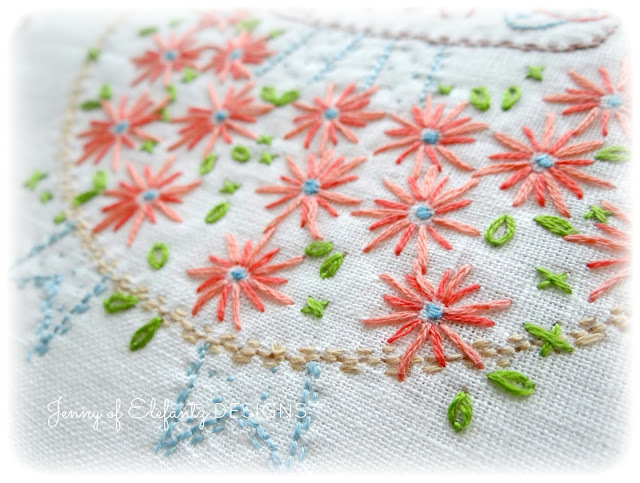 This month's stitchery from "A Year in the Garden" was inspired by a trip hubby and I made to Yungaburra about 5 years ago. There was a beautiful display of old car tyres painted white and hanging on the side of a building with colourful plants inside and I thought at the time that one day I'd create a similar scene in our 'hoped for' home. I must show these photos to Mr E to jog his memory...I have a wall where these would be gorgeous, or perhaps around the pool with flowering cacti? Anyhow, you can see my inspiration, yes? 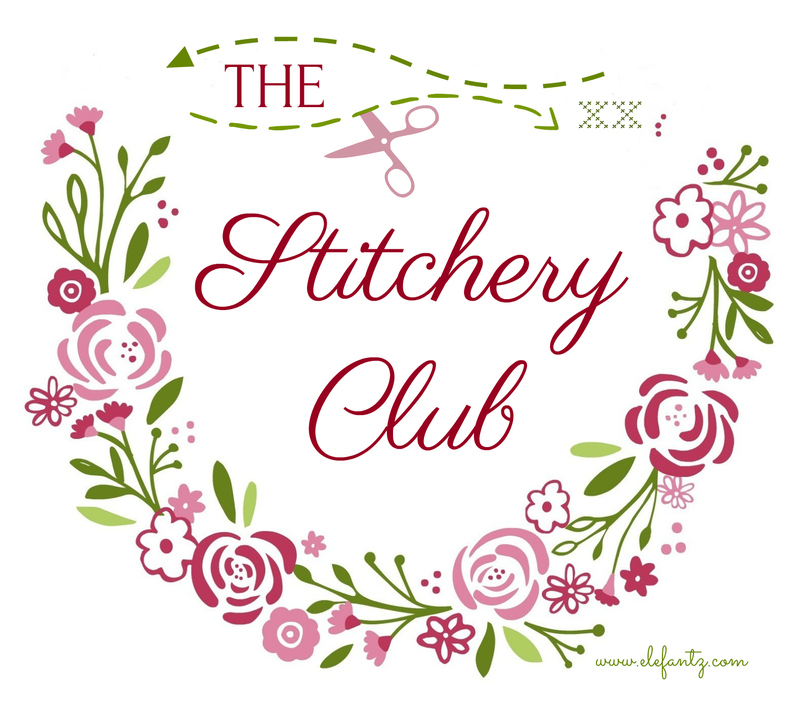 The October pattern is free until the 31st so head over HERE to my shop and download it before then. Not long now and you'll have the entire set of "A Year in the Garden" patterns and can sew them all into a quilt top. 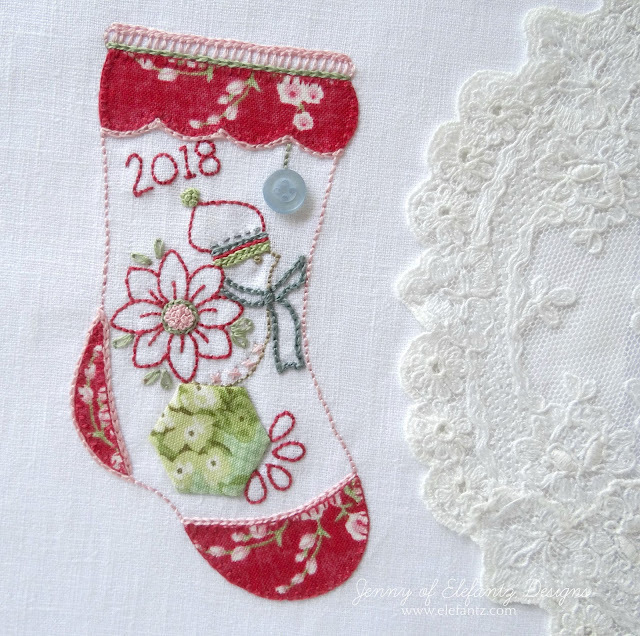 If you've missed any of this year's previous blocks they are all in my shop as a $2 purchase. Are you enjoying this BOM so far? 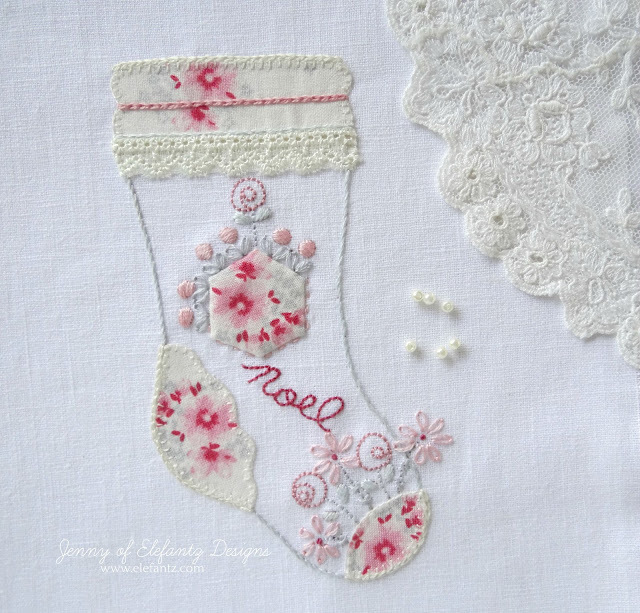 Now on to something different - Christmas! 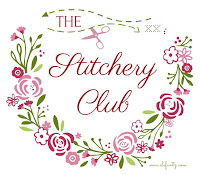 This issue will be emailed to all Club members on October 17th giving plenty of time to stitch for Christmas. Memberships are open all year long and there's no set time you need to be in the Club. Join when you like and leave when you like, no need to explain why. Righto, that's me for today. 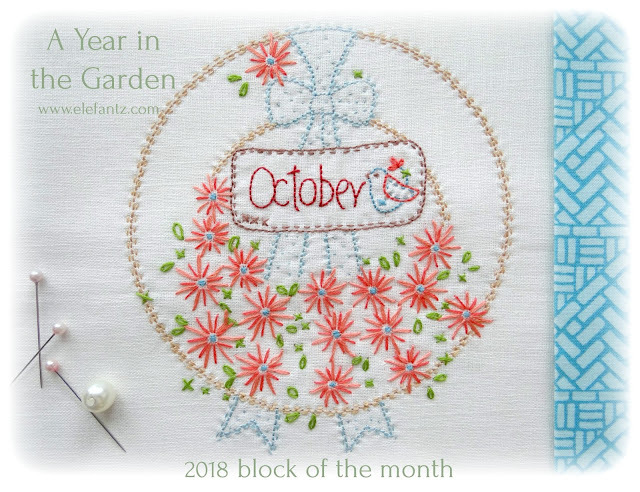 Afraid exhaustion from the move and all it involved these past two weeks has caught up with me and a migraine is knocking behind my left eye...so enjoy the October block and may it bring you pleasure to stitch. 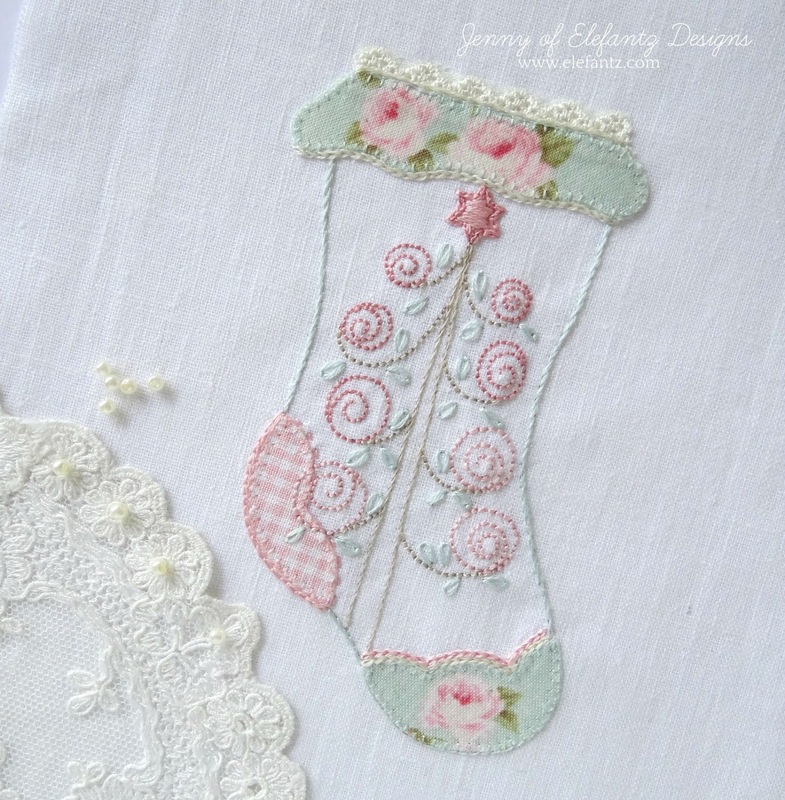 Jenny, your stitching is beautiful. Christmas? Yes, it is not that far away. It is always quiet for us as I doubt my grandchildren will be visiting. Your new home will be such a wonderful place to host Christmas. You have achieved so much in the past few weeks and had to deal with sadness as well so look after yourself. Migraines are nasty so I believe. I never get headaches but have friends who tell me how bad they are. I just wanted to tell you that your stitching is so perfect. You must take great pride in your work!! Migraines are such terrible things. At 67, I don't get them any more. I was diagnosed a couple of years ago with coeliac disease and since I have been on a gluten free diet - no more migraines. Hooray!!! Take it easy - is your DH still at home during the School Holidays. I think NSW school hols. start a week after Qld, so you are probably 1/2 way through them. Is your pool inground - you certainly should make good use of it up in the tropics. Swimming lessons for the little ones??? Autumn here! time to start thinking about planting bulbs for next years Spring colour in the garden! 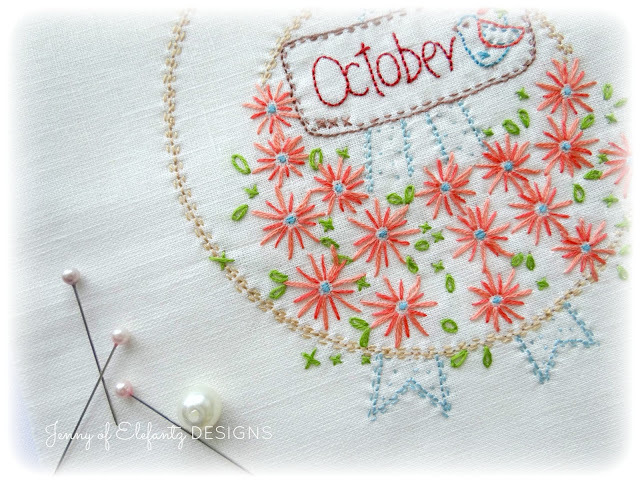 My October mini is displayed with your lovely stitchery. Oh my! 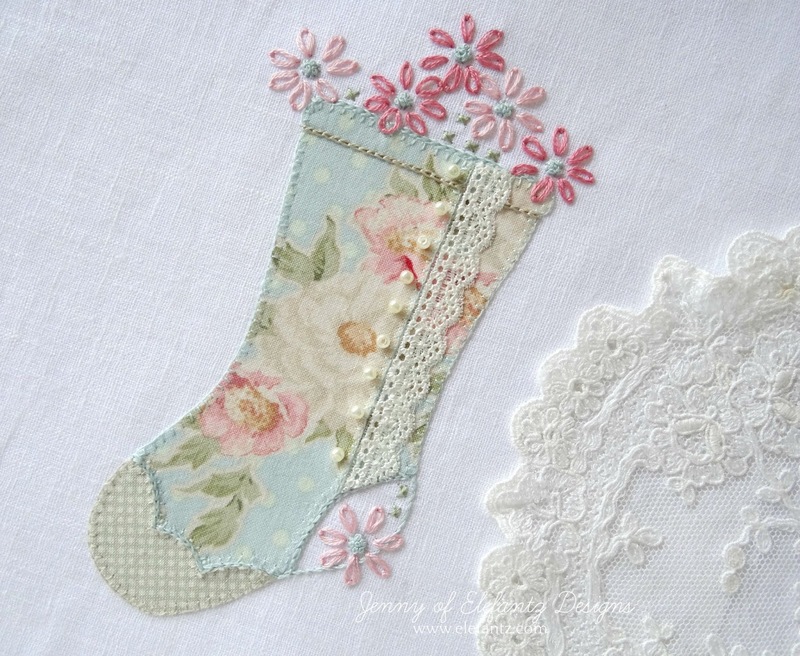 Your Christmas stockings are soooo sweet. I think your inspiration is amazing. Glad you are taking some time to breathe now. Angel hugs. Hmmmmmm......those stocking looks so lovely. 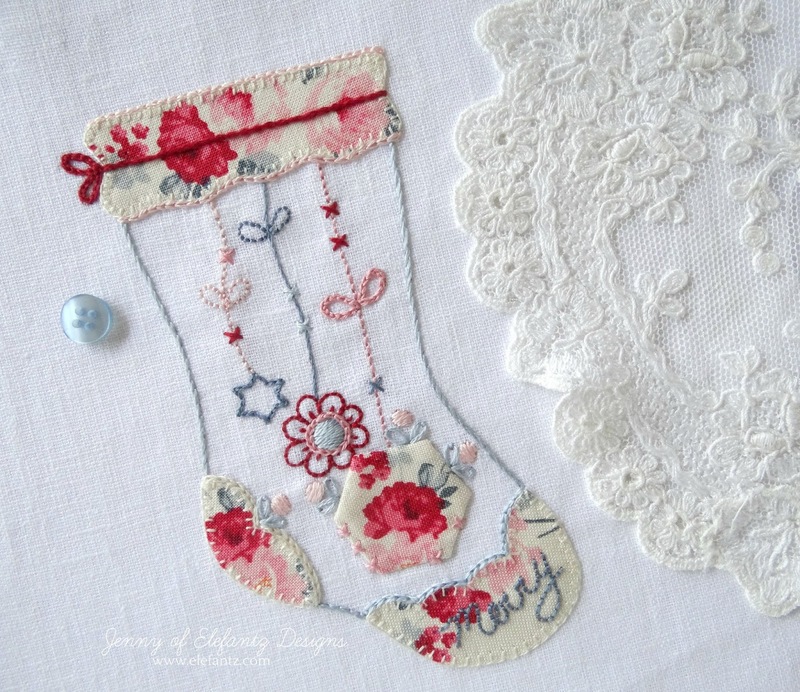 I wonder are you going to make them into real little stocking or frame them, or make mini's to hang. So many ideas! I just love those stockings!! Hello Jenny, I instantly was trying to decide what colors of floss to choose with this delightful October Block! What a wonderful memory to have held onto and now be able to make it happen. I am grinning ear to ear for you and Mr. E for all of the glorious accomplishments he has made for the two of you. I have got to get busy stitching my BOM blocks, I am enjoying them so much. I do hope that this Migraine does not take hold, they are so dreadful! I will be praying for you, Jenny. Take care of yourself and hopefully no migraine so you can have another fabulous day! Hugs. Thank you so much for this wonderful block. It may be my favorite of this year. I appreciate seeing the inspiration, too. I would love to have some of those myself! I wonder how the neighbors would feel about them hanging off my deck? As long as it's in the back yard, they can't see them. =) I think with the white paint, it becomes very attractive. I'm glad you remembered them 5 years later for this block! The Christmas stockings are simply perfect. Every single one is appealing. 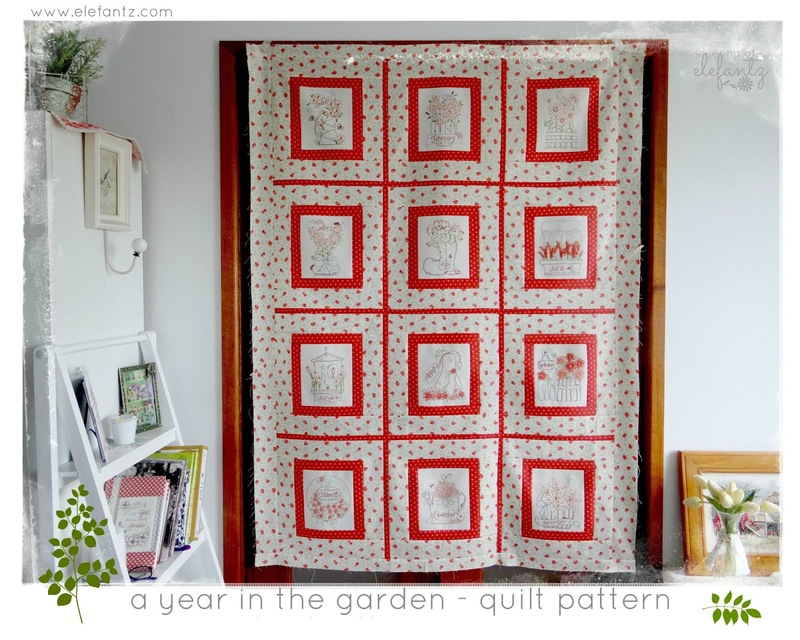 What a wonderful Christmas quilt that would make. 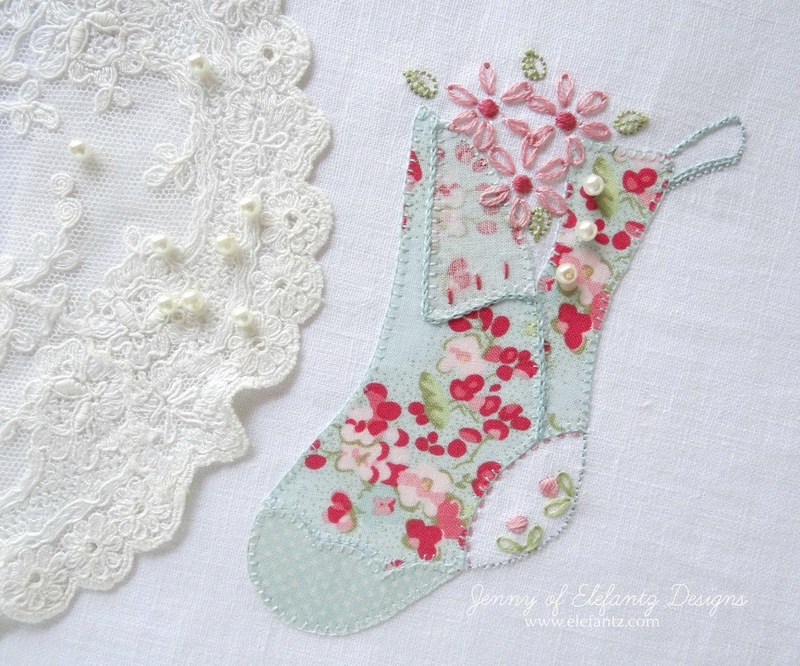 So excited to see all the stockings Jenny, they are gorgeous, can't wait to start stitching them. I think they are lovely, thank you! Always enjoy your designs Jenny - thank you. Coming out of lurkdom to comment on migraines - our DIL suffers terribly from them and she has hit upon something that really seems to help her....she takes a couple of Tylenol with codeine and along with that she adds a muscle relaxant pill (don't know what brand names you have there, but she uses Robaxacet). She said that all the doctors she's been to haven't been able to help her and she finally found this on her own. Hope it might help you. How gorgeous!! And I do love the tire with the flowers, brilliant. But oh Jenny those darling stockings - too, too sweet!! I do hope your migraine doesn't take hold hon, I am praying for you! !